Cut comic strip newspaper 8 inches x 14 inches. Feed through Xyron machine to laminate. Trim edges. Hand sew a button 4 inches from the bottom of the purse, sewing an additional button to the opposite side of the paper, to keep the button from tearing through the paper. Hand sew another button 1 inch from the top of the purse, sewing an additional button to the opposite side of the paper, to keep the button from tearing through the paper. Fold bottom of purse up 5 inches, holding with paperclips. Sew a 1/4 inch seam on both sides. Take off paperclips. Fold top of purse down 4 inches, creasing the fold with your fingers. Tie a button onto the end of the ribbon, and then tie the other end to one of the buttons on the purse. Wind the ribbon around both buttons for a closure. Cut newspaper into long triangle, approximately 8 inches long, with the wide end measuring 1 inch wide. Cover the triangle with glue, using glue stick. Adhere wide end of strip onto cotton swab, and roll the entire strip into a bead. Cut off the ends of the cotton swab. Repeat until you have enough beads to make a bracelet. Seven beads will make a 7 inch bracelet. 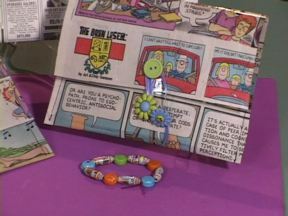 But if you add decorative beads, you will need less comic strip beads. String the beads onto elastic cording, tie in a knot.